The Illinois Bicycle Lawyers at Keating Law Offices have extensive experience and success in handling all types of bicycle-related accidents and crashes. The firm's reputation as premiere bicycle injury attorneys stems from this history of success in winning a wide range of cases on behalf of bicyclists and their families. Keating Law Offices has successfully resolved cases stemming from bicycle accidents in courtrooms across Illinois. 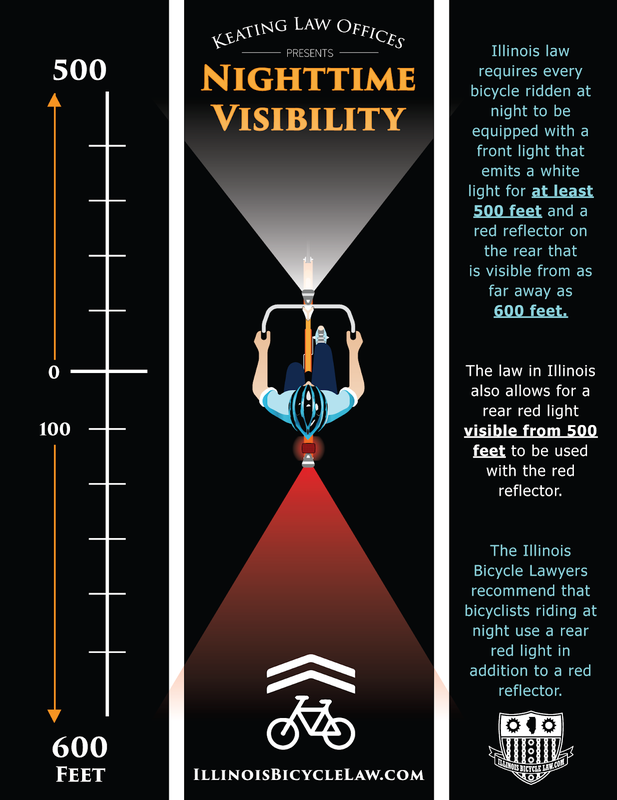 A firm understanding of the bicycle laws in Illinois and industry standards for professional drivers is part of what enables the firm to get such consistent results for its clients. In Illinois, an injured bicyclist or the family of a bicyclist who loses their life in a bicycle crash can pursue a case when it is found that the driver, their employer or the property owner that caused the crash was negligent in how they acted. According to Illinois law "negligence" is the failure to do something which a reasonably careful person would do, or the doing of something which a reasonably careful person would not do, under similar circumstances. 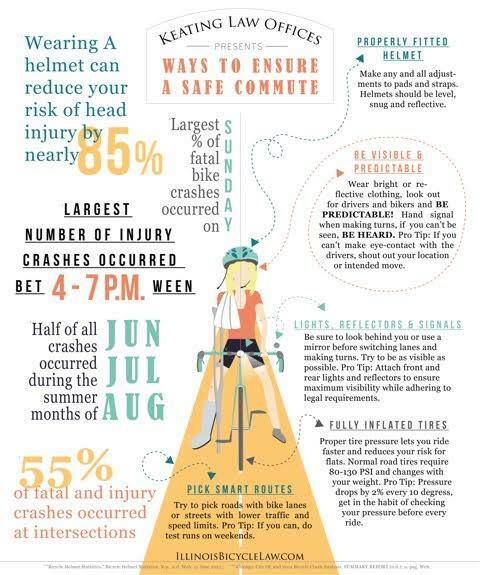 Most often bicycle crashes happen when common practices or laws are broken. has extensive experience and success in handling all types of bicycle accident cases. "The driver of a vehicle shall not drive, unless entering or exiting a legal parking space, or stand, or park the vehicle upon any on street path or lane designated by official signs or markings for the use of bicycles, or otherwise drive or place the vehicle in such a manner as to impede bicycle traffic on such path or lane. The driver of a vehicle shall not stand or park the vehicle upon any lane designated by pavement markings for the shared use of motor vehicles and bicycles, or place the vehicle in such a manner as to impede bicycle traffic on such lane." Passengers and drivers cannot open car doors into traffic. DOORING is opening a car door into the path of an oncoming cyclist. A Left Hook crash happens when the bicyclist and the motor vehicle are travelling towards each other in opposite directions and the motorist turns left in front of the oncoming bicyclist. The law said that it is up to the driver to only turn when there is a "safe interval." Left Hooks are one of the most common types of bicycle accidents in areas with busy intersections. Left Hooks are specifically prohibited by both the Illinois Vehicle Code and Chicago's Municipal Code. "The driver of a vehicle intending to turn to the left within an intersection or into an alley, private road, or driveway shall yield the right-of-way to any vehicle approaching from the opposite direction which is so close as to constitute an immediate hazard, but said driver, having so yielded may proceed at such time as a safe interval occurs." "The driver of a vehicle within an intersection intending to turn to the left shall yield the right-of-way to a bicycle approaching from the opposite direction which is within the intersection or so close thereto as to constitute an immediate hazard." Drivers who are exiting an alley, driveway, parking lot or other entrance into a roadway are required to yield to a bicyclist who is riding down that roadway. Section 11-906 of the Illinois Vehicle Code states,"The driver of a vehicle about to enter or cross a highway from an alley, building, private road or driveway shall yield the right-of-way to all vehicles approaching on the highway to be entered." 49 C.F.R. Section 383.111 of the Code of Federal Regulations requires a professional driver to recognize and avoid potential hazards at all times. Bicyclists in Chicago and the adjacent suburbs where the Chicago Transit Authority operate are in constant interaction with Chicago Transit Authority buses. In addition to the Illinois Rules of the Road and the traffic rules in the Municipal Code of Chicago, CTA bus operators are also required to follow the Chicago Transit Authority's Standard Operating Procedures (SOPs) and follow training about operating a CTA bus around bicyclists. The Chicago Transit Authority even publishes a diagram entitled "Sharing The Road With Bicycle Riders For Bus Operators" that is distributed to its bus operators. These SOPs and the CTA's own training can be the basis for proving negligence against the CTA and its bus operator that led to a bicycle accident. 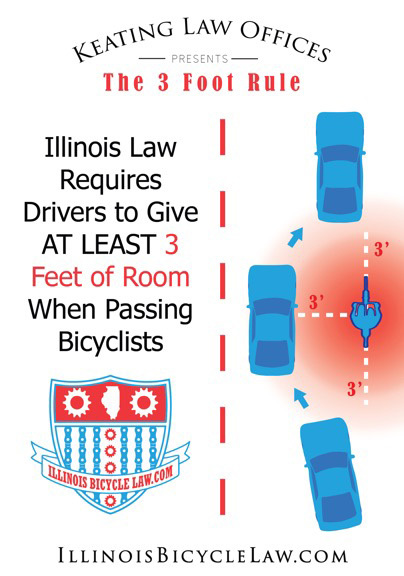 The operators of motor vehicles are required under Illinois law to give at least three feet between their vehicle and a bicyclist when passing the bicyclist. This rule of the road is what is commonly referred to as the "3-Foot Rule" and is unfortunately a common violation that leads to bicycle accidents. It is important to note that this law requires a minimum of three feet and mandates a "safe distance." Anytime a bicycle crash occurs where there is contact or the bicyclist is "buzzed" there is a violation of this law. The attorneys at Keating Law Offices frequently rely on this law in prosecuting cases in civil court against drivers that cause bike accidents. The law itself is contained in Section 11-703 of the Illinois Vehicle Code. (d) The operator of a motor vehicle overtaking a bicycle or individual proceeding in the same direction on a highway shall leave a safe distance, but not less than 3 feet, when passing the bicycle or individual and shall maintain that distance until safely past the overtaken bicycle or individual." The referenced Section 11-904(b) requires drivers approaching a stop sign to come to a complete stop before entering a crosswalk at an intersection and to yield to the right-of-way of any vehicle (including bicycles) that enter the intersection. A motorist is responsible for a bicycle accident in they fail to yield to a bicyclist that is legally crossing a crosswalk. Unfortunately many bicyclists are the victims of acts of Road Rage. A 2008 change to Illinois law made a specific law that motorists could not drive "unnecessarily close" to a bicyclist in a reckless manner. This is a specific provision under Section 11-703 of the Illinois Vehicle Code that provides the 3-Foot Rule. Violations of this law can result in a fine or even a felony charge if the bicyclist is injured or killed. If necessary or if requested to arrange for medical care for the injured bicyclist. "The driver of any vehicle involved in a motor vehicle accident resulting in personal injury to or death of any person shall immediately stop such vehicle at the scene of such accident, or as close thereto as possible and shall then forthwith return to, and in every event shall remain at the scene of the accident until the requirements of Section 11-403 have been fulfilled." Illinois insurance law requires automobile insurance companies to offer what is known as underinsured motorist coverage and uninsured motorist coverage. This insurance coverage can be invaluable to injured bicyclists. The Insurance Research Council estimates that more than 1 in 8 motorists are driving uninsured. Unlike liability insurance coverage which is provided by a driver's insurance company, underinsured or uninsured motorist coverage is provided by the insurance company for the bicyclist. Undersinsured motorist coverage is when the at-fault driver only has a small amount of insurance and more can be obtained from the bicyclist's insurance. Uninsured motorist coverage comes into play when the driver had no insurance or when it is a hit-and-run crash and the driver cannot be located. These types of insurance are typically available when the bicyclists is covered by their own insurance or that of a family member, employer or roommate. While most bicycle accidents occur when there is a collision between a bicyclist and a motor vehicle, a common cause of bicycle crashes is when the bicyclist unintentionally loses control of their bicycle as a result of hitting a pothole or some other kind of defect on a roadway, sidewalk or parking lot. These types of cases are generally known as "premises liability" type cases. In Illinois there is a "Premises Liability Act" that holds that the owner or occupier of the premises must use reasonable care to keep the premises safe. The Illinois Premises Liability Act is statute 740 ILCS 130/2. A property owner or occupier (like a store that rents a building) can be liable for injuries to a bicyclist if they: (a) know or by the exercise of reasonable care would discover the condition, and should realize that it involves an unreasonable risk of harm to such invitees; (b) should expect that they will not discover or realize the danger, or will fail to protect themselves against it; and (c) fails to exercise reasonable care to protect them against the danger. A defective bicycle or bicycle-related product that leads to an injury may be the basis for a product liability claim under Illinois law. Common examples of product liability cases are when a component or frame unexpectedly breaks and the bicyclist crashes and is injured. In Illinois, an injured person may pursue under the doctrine of "Strict Product Liability" when basically two conditions are met. First, an unreasonably dangerous condition or defect existed in the product. Second, the condition or defect at the time the product left the manufacturer's control, and the condition was the primary cause of the rider's injury. We have resolved hundreds of other bicycle accident cases with other insurance companies. The bicycle attorneys at Keating Law Offices have the experience and commitment to handle a legal case or insurance claim against any insurance company or corporation providing insurance coverage for a claim that happened in Illinois or involving an Illinois resident. If you are not certain as to whether there may be insurance for a bicycle accident you were involved in, please feel free to contact Keating Law Offices with any questions. 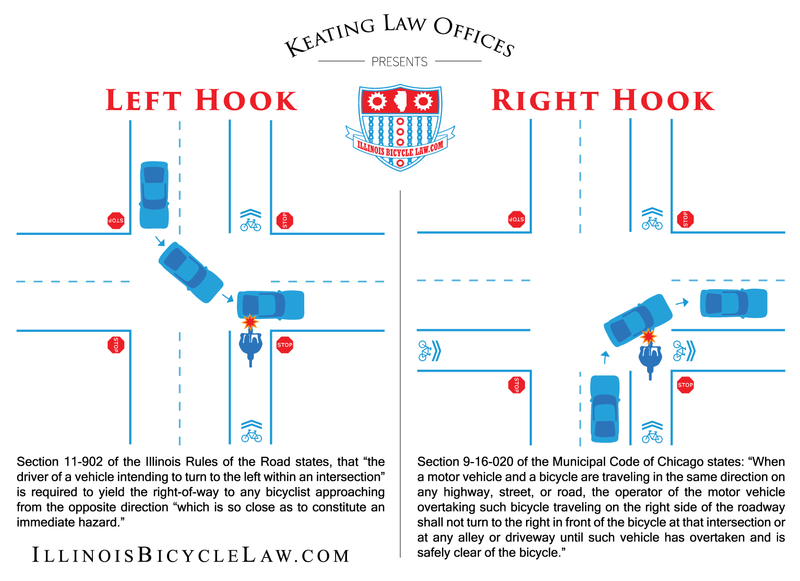 You can contact Illinois Bicycle Attorney Mike Keating at 312-208-7702 or MKeating@KeatingLegal.com 24 hours a day, 7 days a week. All e-mails and phone calls are returned promptly and all initial consultations are confidential and absolutely free.